Like snowflakes and paw prints, every dog is unique. Their actions and responses are what make up their personality. Broken down, a dog’s personality is made up of three components that blend together to create the individual: genetic drives and instinctive traits, emotional responses, and behavioral tendencies. As you teach your dog and expose her to various settings and situations, you can predict her responses based on her personality. For example, if you have a shy dog, you don’t need a crystal ball to foresee her response when a stranger comes to call. On the other hand, if your dog is assertive and outgoing, you can easily anticipate her reaction if you were to bring her to a picnic. Identifying your dog’s personality can help you in your training endeavors, from the directions you teach to how you can extinguish undesirable behaviors. Pet dogs don’t exist alone, nor can they just “pick up” information from human language naturally. The first step in any humane endeavor to live happily with your dog must be to identify her personality and then create a training regimen that empathizes with her learning style and abilities. The various kennel clubs around the world divide their recognized dog breeds into groups. The American Kennel Club has seven such divisions, which group dogs according to function. The Hound group, for example, links dogs who are designed to hunt prey. Though you can reference more information on each breed in Interpreting Your Dog’s Breed-Specific Traits, simply being aware of the various tasks your dog was bred to fulfill provides invaluable information about his genetic drives and instinctive traits. Although breed characteristics are a matter of genetics, individual dogs within any given breed can have vastly different personality traits, from shy to laid-back to bossy. For example, if you’re observing a litter of cairn terriers, you can predict that each puppy would be alert to sounds and love to dig. However, the shy puppy would be more responsive to your interference than would the selfassured one. At the end of the day, the real foundation for your dog’s personality is encoded in his genes. In essence, his personality won’t vary much over his lifetime. This knowledge can give you a pretty good idea of how your dog will act in many different situations and does allow you greater flexibility to influence his behavior. For example, if you have an active dog that is overstimulated in social settings, simply hoping he’ll calm down is not an effective training technique. Exercising him a few hours before the event, teaching him to fetch, and arriving with a favorite toy, however, are effective ways to encourage a high-energy dog’s cooperation. As far as breed-specific tendencies go, recognizing the passions and limitations of your dog’s breed or mix of breeds also helps you select appropriate games, displacement activities to distract him so that he stops an unwanted behavior (which may include offering chew toys and such), and training exercises patterned to be consistent with his predispositions. Compare two breeds: a golden retriever and a German Shepherd. Retrievers are a highly sociable breed, with few serious thoughts save, “Could you please just toss the ball one more time — pleeaaassse.” German Shepherds, on the other hand, are dignified, territorially proud, and mindful of other’s social intent. Mix these two breeds, and you’ll notice their difference immediately. Whereas the German Shepherd will be reserved and spatially respectful, the retriever will throw herself on everyone just to be acknowledged. The following personality form is a generic test generally offered to puppies between the ages of 7 weeks and 6 months of age. You can also apply the test to older dogs, with appropriate modifications, to take into account the dog’s size or potential for being snappish or fidgety. Each part of the test focuses on specific issues that, when examined as a whole, outline personality characteristics that make a certain breed or individual puppy ideal for a particular person’s interest. For example, the traits that make a good guard or protection dog aren’t those that would make for a good pet in a house full of young children. Puppy personality tests were developed to predetermine appropriate candidates for service work — for example, Guide Dogs for the blind — as an economic necessity because no one wanted to spend time and money training dogs that wouldn’t successfully finish the course and fulfill the work requirements. Over time, behaviorists modified these tests for the general public; William Campbell and Joachim and Wendy Volhard are names to be recognized in this effort. The test is ideally administered by someone unfamiliar to the dog in an unfamiliar environment because you’re interested in the dog’s initial reactions to someone he doesn’t know. If you’re meeting the puppy for the first time, and you’re confident in your ability, simply ask the breeder or facility to grant you access to a private room to employ the following series of exercises. If you’re familiar with the dog or puppy, ask a friend or a professional to give the test. If you’d like to observe, please do so from a window or distant area in the room so as not to influence the dog’s reaction to the tester. Can you modify your dog’s personality? While you can’t change your dog’s genetic makeup and the predispositions that make up his personality, you can certainly influence many of his behaviors. A dog that is naturally dominant and aggressive can learn to control those behaviors in many circumstances; a dog that is naturally shy and fearful can learn to deal with frequently occurring events that initially frightened him. In Helping Your Dog Learn from Everyday Living, we provide tools and techniques that can be effective in shaping behaviors, and in Meeting the Needs of Your Growing Puppy and Happy Training, Happy Tails, we outline specific socialization, training, and problem-solving exercises to help you positively influence your dog’s personality. This test generally takes 10–15 minutes and should be administered when the dog is relaxed, such as after a nap, but before mealtime. (Please check the shelter’s time schedule and make the appointment ahead of time.) Limit the noise and visual distractions when testing the dog or puppy. Test 1: This exercise measures the dog’s social attraction to humans. 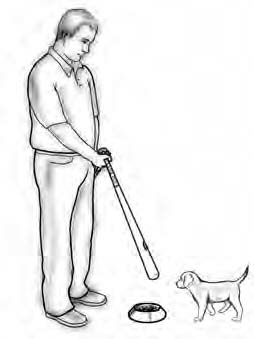 The tester kneels on the floor to be level with the puppy to appear less threatening (see Figure 5-1). The assistant carries the puppy into the room and places her about 3 or 4 feet from the tester, facing him or her. As soon as the dog is on the floor, the tester calls her. However, don’t use the dog’s name or the word “Come.” The tester should attract the dog by using a sing-song or playful “Puppy, puppy, puppy” perhaps assisted by lightly clapping his hands. If the pup comes to the tester, put a check mark in column S. If she acts anxious, runs and hides, or stays and whimpers, put a check in column N. If she ignores the tester or wanders off on her own agenda, mark column I. If she comes readily but then jumps up on the tester or mouths or nips his hands, or if she doesn’t come at all but growls, check column A. Test 2: This exercise, which looks at the pup’s attention and willingness to follow or stay with a person, is also a test of social attraction. 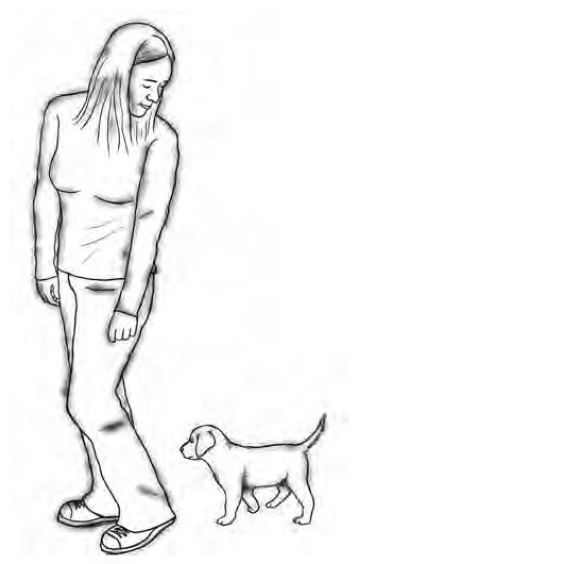 The tester stands and verbally encourages the dog to follow by saying “Puppy, puppy, puppy” (not the dog’s name) as the tester walks forward and pats her leg (see Figure 5-2). Figure 5-1: Test 1 for social attraction involving approaching a person. If the dog follows readily, check S. If the dog runs away or doesn’t move while acting anxiously or whimpering, check N. If she doesn’t follow at all or wanders off without any signs of nervousness, check I. If she follows immediately, but gets underfoot while mouthing or nipping at the tester’s feet, check A. Tests 3 through 5 measure the balance of dominant and submissive traits and a puppy/dog’s willingness to accept human leadership when socially or physically forced to submit or comply. Using these tests on a mature dog that has a history of aggression is both unwise and unsafe. If you’re testing an older dog, conduct these tests carefully. Immediately terminate any test in which the dog growls or snarls, entering a check in the A column and moving on to the next test, or terminating the test session if you feel the least bit threatened. 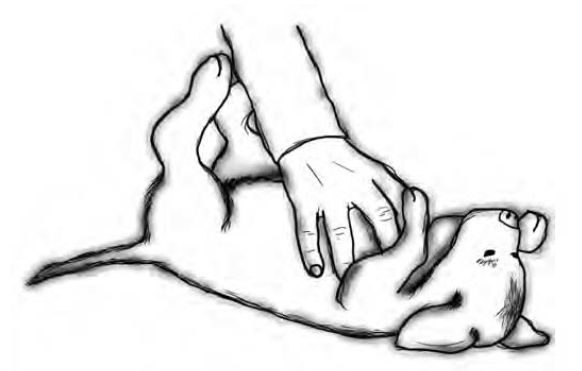 Test 3: This exercise involves kneeling on the floor and gently rolling the pup onto its back so that his legs are pointing up, as in Figure 5-3. The assistant starts the stopwatch while the tester’s hand exerts just enough pressure on the dog’s chest to keep her on her back. The tester should look directly at the dog with a nonsmiling but nonthreatening expression. If the dog looks away, don’t force eye contact. When the assistant indicates that 30 seconds have passed, the test is over, and the puppy should be released immediately. If the pup initially struggles but then settles down or gives up, check S. If the pup doesn’t struggle and tries to avoid eye contact, whimpers, or dribbles urine, check N. If the dog struggles a bit on and off throughout the time period and doesn’t seem to be settling down, check I. If the dog struggles fiercely throughout the 30 seconds, or if the dog tries to bite or growls at any point, check A. Figure 5-2: Test 2 for social attraction involving following a person. Figure 5-3: Test 3 for social dominance when the puppy is restrained. Test 4: This next test measures a dog’s forgiveness, so it must be done immediately after Test 3, because the dog has just been physically restrained and may hold a grudge for that. 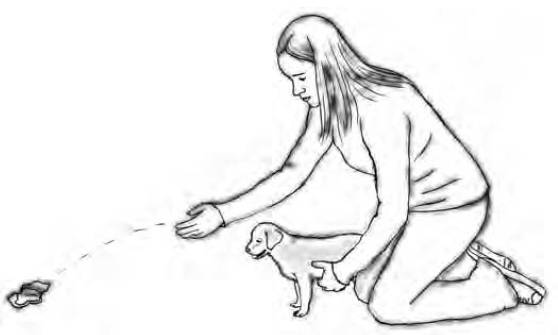 It begins with the tester kneeling down and placing the puppy in a sitting position in front of him, as shown in Figure 5-4. The dog should face the tester, not directly, but at an angle of about 45 degrees. Now the tester should begin to stroke the pup slowly and gently with one hand starting at the head and continuing down to the tail. All the while, the tester should talk quietly to the dog, while leaning with his face close enough for the puppy to lick it if she wants to. If the dog snuggles closer to the tester and tries to lick his face or squirms a bit and licks the tester’s hands, check the S column. If the dog rolls over and then licks the tester’s hands or tries to move away, check N. If the pup growls, mouths, or nips, check A. If the dog seems unresponsive, neither approaching nor moving away, and seems unconcerned and uninterested, check I. Test 5: This social dominance test measures a dog’s response when she’s placed in a vulnerable position. 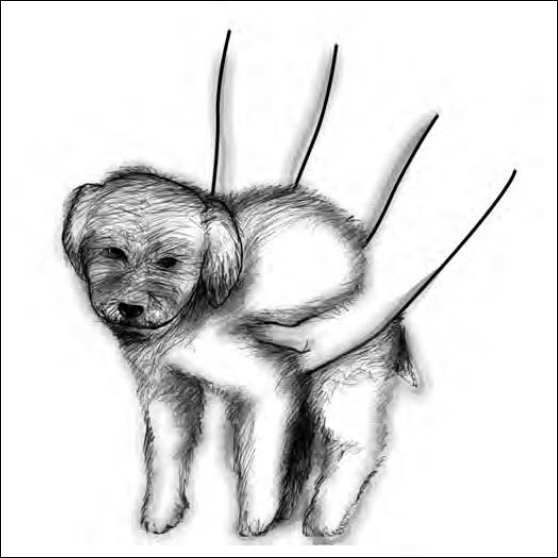 The evaluator bends over the puppy, who is facing in the opposite direction, and lifts her so that her legs are just off of the ground (see Figure 5-5). An assistant can time 30 seconds before the pup is returned to the ground. (Obviously you can’t easily do this test with larger dogs.) If the pup is relaxed and doesn’t struggle, or if she struggles briefly and then settles down, check S. If the pup doesn’t struggle but whimpers or runs away when placed back on the ground, check N.
If the pup struggles fiercely for most of the interval, runs away when placed back on the ground, or growls, nips, mouths, or barks while being held or when returned to the ground, check A. If the dog seems unresponsive and simply wanders away as if nothing happened when returned to the ground, check I. Figure 5-4: Test 4 for social forgiveness. Figure 5-5: Test 5 for social dominance when puppy doesn’t have control. Test 6: This test involves retrieving, which shows a dog’s willingness to work with people. 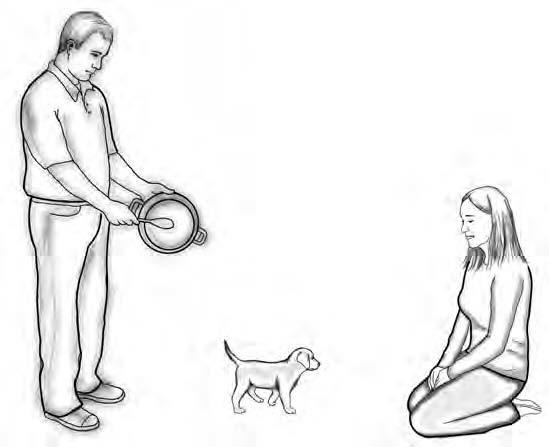 The evaluator kneels, placing the puppy just in front of his knees, as shown in Figure 5-6. Dangle a crumpled-up ball of paper (slightly smaller than a tennis ball) in front of the puppy’s face — tease the dog, as well as verbally bait her: “Do you want it?” The moment the puppy shows any interest, toss the ball 3 feet in front of her. 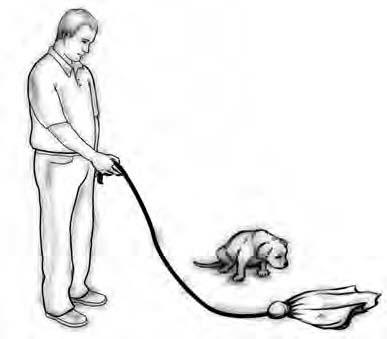 If the puppy sets out to retrieve it, the evaluator should back up a few feet and cheer the puppy back to his side. If the puppy returns (even part way) with the paper or if she drops the paper but still comes back to the tester, check S. If the pup chases the paper ball and then stands over it and doesn’t return, or if she starts to chase the paper and then loses interest, check I. If the pup fails to chase the paper at all, moves away from the tester (and the paper), or seems simply uninterested and doesn’t move toward the paper ball, check I. If the pup chases the paper, picks it up, and then runs away, check A. What does retrieving have to do with personality? Clarence Pfaffenberger developed a puppy evaluation test to determine the probable success of puppies chosen to guide the blind. Until the mid-1940s, when he first became involved in Guide Dog selection and training, only 9 percent of the dogs successfully finished the training program. When Pfaffenberger started a testing program, he found that the best single indicator of whether a dog would successfully complete the program was whether she would retrieve as a puppy. Pfaffenberger believed that retrieving at this age was really a test of willingness to work for and with humans. Figure 5-6: Test 6 for willingness to retrieve. Test 7: This exercise focuses on a puppy’s touch sensitivity, noting that a dog who is too touch sensitive is often hard to handle. It involves pinching the pup’s ear flap three times, starting with medium force, with the next pinch being medium hard, and the last very hard. The tester should practice beforehand on himself (not the pup) by squeezing the forefinger of one hand between the thumb and forefinger. Make sure that the squeeze doesn’t involve gouging with fingernails. 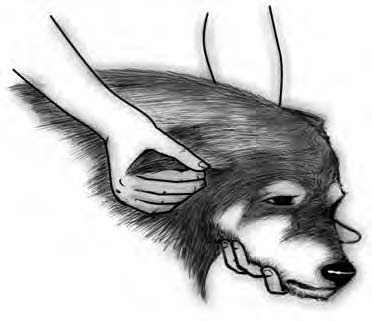 The tester should grasp the flap of the dog’s ear between his thumb and forefinger and give the first pinch, followed by the second and third separated by about two seconds (see Figure 5-7). If the pup responds to the first or second pinch by whimpering or yelping, stop the test immediately and check column N. If at any point the pup growls, mouths, or nips, stop immediately and check A. 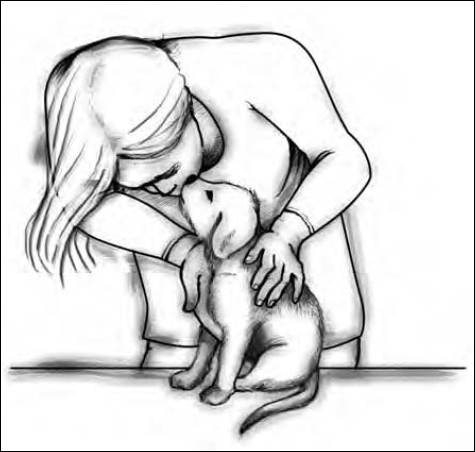 If, on the second or third pinch, the pup tries to pull her head or body away, or turns to look at your face without any other response, check S. If the pup seems unresponsive or uncaring during the whole test, check column I. Figure 5-7: Test 7 for touch sensitivity. Test 8: This exercise focuses on a puppy’s threshold of excitement as it relates to unfamiliar sounds. When applying this test, the puppy should face away from the direction of the sound and not interact with the evaluator until the exercise is finished. An assistant hidden from view should give three sharp raps of a metal spoon against a metal pot and should then freeze in position, avoiding eye contact with the dog (see Figure 5-8). If the dog acts interested and moves toward the sound or obviously listens and orients her head curiously in the direction of the sound, even if she seems startled at first, check S. If the pup barks in the direction of the sound or growls or mouths the assistant, check column A. If the pup cringes, backs off, or tries to hide, check N. If the pup locates the sound but stays in place and barks, enter a check mark in column S. If the pup ignores the sound completely or only gives a quick flick of its head in the direction of the sound and then looks away, check I. Test 9: This test measures a pup’s reaction to unusual, but nonthreatening, events. Initially, an assistant stands off to the side, holding on to the end of a string tied to the end of a towel. The assistant then jerks the towel in regular intervals toward himself (see Figure 5-9). If the dog looks at the test object, displays curiosity by approaching, or tries to investigate it, check S. If the dog ignores the test object, check I. If the dog lunges, stands fast and barks at the towel, growls, or attacks it, check A. If the pup shies away or hides from the towel, check N.
Figure 5-8: Test 8 for sound sensitivity. Figure 5-9: Test 10 for reaction to potentially threatening events. Test 10: This exercise tests a puppy’s reaction to a perceived threat. The assistant should position himself about 6 feet from the dog, quietly holding an umbrella (one that opens on a spring release is best). Now the evaluator should turn the pup so that she’s facing in between the assistant and the tester, as shown in Figure 5-10). 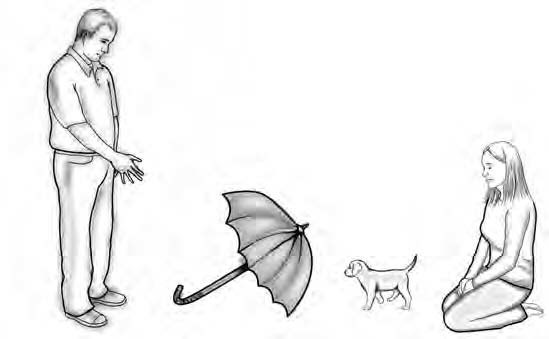 When the puppy is looking toward the assistant, she should open the umbrella quickly, quietly setting it on the floor without looking or addressing the puppy. If the dog reacts but regains its composure within a moment and then approaches to investigate the umbrella, check S. If the dog stands and barks, or approaches and growls or snaps at the umbrella, check A. If the dog tries to run or hide, check N. If the dog shows little or no interest in the umbrella, check I. Test 11: The next test measures possessiveness. If the puppy you’re testing has many checks in the “A” column, be mindful of her reaction. An aggressive puppy may bite if her growls aren’t met with an immediate withdrawal. If the puppy/dog growls, consider this candidate seriously: She’ll require mindful and consistent training and isn’t suitable for a family with any exposure to young children. Place a bowl on the floor and add kibbles to it. When the pup has started to eat, use a long stick, broom handle, or baseball bat to pull the bowl away from her, as shown in Figure 5-11. If the pup looks at you and wags her tail expectantly, put a check in the S column. If she runs away or acts as if she is now too upset to eat, check N. If she growls, barks, bites the stick, or jumps on you to get the food back, check A. If she acts as if she’s uninterested in the food after all, check I. Figure 5-10: Test 9 for reaction to novel events. Test 12: If the puppy you’re evaluating is comfortable on a leash and collar, lead her to an unfamiliar room or, if inoculated, outside. Observe your candidate’s behavior as you walk around the block or circle the house. Try to find birds, cats, squirrels, or people for the puppy to encounter. If the pup stays close to you even though she’s showing a curious interest in things going on around her, check S. If the pup acts nervous and scared and tries to run from any encounter, check N. If the pup barks and lunges at everything, check A. If the pup acts uninterested in anything that you try to point out to her and shows interest in only occasional things that she finds for herself, check I. Figure 5-11: Test 11 for social dominance and guarding of possessions. If you’ve shared life with a dog for some time, you already know a lot about her personality. If you haven’t given it much thought, we encourage you to use the following questionnaire to determine your dog’s personality. This test is designed to measure the personality of an adult dog (actually, any dog older than 6 months) who has lived with you for at least one month. Of course, as every parent knows (whether your child walks on two legs or four), you may have a bit of bias. As you ponder these behavioral adjectives, check with a family member or friend. The purpose of this test is for you to learn the real nature of your dog’s personality. This test is made up of a set of words or short phrases, which are descriptions that can apply to a dog. For each one, your task is to consider whether that description applies to your dog. If it does, then simply put a check mark next to it. If not, leave that word blank and go on to the next. Check all items that describe your dog. Both the puppy and adult personality tests use the same final score sheet and general interpretation scheme. For the puppy personality test, the scoring is quite simple. Using the score sheet in Table 5-2, simply count the number of check marks in the column marked S, and enter that total on the line marked S below. Count the check marks in columns N, A, and I, and enter their totals, respectively, in the score sheet, and you’re now ready for interpretation. For the adult personality test, look back at the list of items. Notice that each item has a little number superscripted just behind it. These numbers are your scoring codes. First go through the list and count all the items you checked that have the number 1 code. (Remember, you’re counting the total number of checks, not adding the scores.) That total is entered on the line marked S in the score sheet. Next count all the items you checked with the number 2 code, and this total is entered in the line marked A. The total number of items that you checked with the number 3 code goes on the line marked I, and the total with the number 4 code goes on the line marked N.
For each of the tests, you can look at the total scores and get a general overview of the dog’s personality. The category that has the largest total score shows what kind of a dog you’re dealing with and allows you to generally predict what you may expect from her. For the puppy test, the general personality classification is the kind of dog the pup will mostly grow up to be. However, because the dog is still young, its personality can still be somewhat shaped and modified by how you treat it and the kinds of experiences that it has in the future and as it matures. For the adult test scores, we’re looking at a broader range of behaviors so that we can be a bit subtler in our description of the dog. In essence, the adult has had more time and experience in the world, which has molded her behavior so that we can pick up on some nuances and shadings. High Sociability, High Dominance, Low Nervousness, and Low Independence: These dogs enjoy working, have a strong sense of themselves, and aren’t easily stressed. Highly motivated, these dogs require a delicate balance of firmness and structured inclusion to bring out the best in them. Medium Sociability and Dominance with Low Nervousness and Low Independence: These are easily trained dogs who are easy to get along with and aren’t easily flustered or distracted. This combination makes good all-around dogs. High Sociability, Low Dominance, Low Nervousness, and Low Independence: These dogs are laid-back and loving, seldom, if ever, frantic or hyper, and an ideal pet for families or novice dog owners. Assertive/Aggressive: Two combinations of personality scores may be difficult to deal with in the wrong environment. The first is the dog with High Dominance and High Nervousness with Low Sociability and Low Independence. This dog is highly reactive when startled, and, when fearful, may snap out at anyone — friend, family, or stranger. This dog may also show displaced aggression when overstimulated, striking out at anyone if she’s unable to attack the source of her frustration. The second troublesome personality combination is the dog with High Dominance and High Independence with Low Sociability and Low Nervousness. This dog is often more focused on her own needs than on the collective dynamics of her group. Unless coached with persistence, this dog may use aggression to modify others and as a means to get his way. Sociability (scale S) is really more than its name suggests. An important aspect of this personality dimension is friendliness and a desire to interact with others — what some researchers may call a pack drive. Dogs that score high on this dimension bond well with people, and because they look to humans (or other dogs) for guidance and feedback, they’re extremely adaptable. These dogs are probably best for first-time owners and people who want a low threat, low hassle, and friendly family pet. Nervous/Shy (scale N) is a measure of both how submissive and how reactive a dog is. A high score indicates a puppy/dog who is notably reactive to change or stimulation. Common adjectives include “shy,” “timid,” and “skittish.” Common complaints include “easily frightened,” “afraid of men with hats (or beards or glasses),” “frightened by the sound of trucks (or vacuums, thunder, or crowds),” “uneasy around children (or large dogs or flickering lights),” and so on. Unless extensively socialized, these dogs are unpredictable and react to any fluctuation in their schedule or unexpected events. Though not a family dog candidate, this dog can flourish with a steady trainer and predictable environment, as found with single people, an adult couple, or older persons without grandchildren. In these settings, these dogs are often affectionate and needy: a good match for the right person. The greater the score in the N range, the more unsteady the dog will be when interrupted or stressed. This dog necessitates more patience and support and isn’t recommended for families or social people who intend to bring their dog along with them wherever they go. Dogs in this category require careful watching and a lot of training to put them under control. Untrained or mismanaged, these dogs may assert themselves over whomever they can: children and other pets decidedly not excluded. In the right home, however, these dogs can be managed, trained, and appreciated. A high score in this area indicates a high-intensity performance drive. Active, curious, and driven, these dogs excel at specific activities, such as agility or flyball, or service tasks, such as tracking or bomb detection. Though not dogs for the average family or novice handler, they can make good reliable companions who will devote themselves to a handler that is just a little more dominant than they are. If your dog has bitten you or anyone else, please get professional help. Active aggression is beyond the scope of this book. Dogs with high scores in the Independent (scale I) dimension can be standoffish, stubborn, and uncooperative, committing to family affairs on their terms alone. Comfortable with their own agenda, these dogs relate to people when prompted by a positive source, such as food or a favorite activity. Many of the instinctive breeds (from the Terrier or Hound groups, for example) score high on this scale, as they weren’t bred to work with man, but rather on their own, tracking or hunting game. Lest anyone discard this group of dogs altogether, they’re ideal for many situations, such as living with people who are busy or away from home for regular stretches. Dogs that score high on the independence range are often more distractible, prioritizing their environment over human direction.